On Tuesday, 14 April WYSE Travel Confederation’s Greg Richards discussed the importance millennial travellers place on interacting with the local community during their travels, as well as their concern about the economy, reflected in a shift away from purely leisure travels and towards trips that could aid their personal development. Discussing findings from the Millennial Traveller survey by WYSE Travel Confederation, Greg began the session by defining millennials as young people born after 1980 who know little of the pre-internet age and therefore are constantly digitally connected, most especially to their smartphones which 77% of respondents in the Millennial Traveller report series said they own. Young travellers make up 20% of international tourism and produced USD 230 billion in tourism receipts in 2013. Fifty percent of respondents to the Millennial Traveller survey spent over EUR 1,000 for their trip, which is above the average spend by travellers globally. Clearly, youth travellers should not be seen as equivalent to budget travellers. This level of spending by millennials is significant for local tourism industries as WYSE Travel Confederation research identified that the top three most important features of a trip for young people were collecting new memories, learning about local culture and trying new foods. “Arguably, the local is becoming the new authentic in the tourist experience” stated Greg, who also acknowledged that “local food is an increasingly important element for destinations and the tourism market as a whole”. WYSE research findings point towards opportunities for local tourism companies to reach millennials. 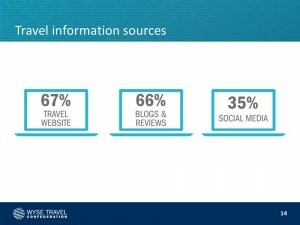 More than a third of respondents identified that they use travel websites as an information source for planning travel, and a similar portion also used blogs and reviews to help plan their trips. Almost half of respondents stated that travel reviews affect their travel decisions always or often. During the webinar it was revealed that the majority of respondents to the Millennial Traveller survey are either “very” or “a bit” concerned about global warming, but their major concern is the economy. Greg suggested that this concern was due to the continued adversity that millennials face in the job market. Indeed, millennials placed little importance on backpacking/travel experience as a success factor for their future career. In contrast work experience, having a university degree and studying hard were seen as the top three success factors for future career. 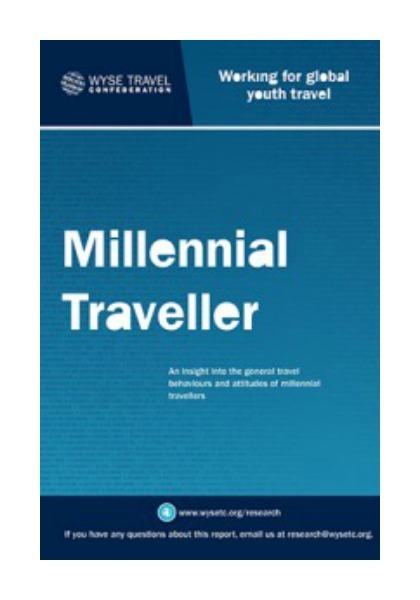 The Millennial Traveller report offers insight into the general travel behaviours and attitudes of millennial travellers – a generation of young people characterised by its familiarity with new technologies. The second report in WYSE Travel Confederation’s Millennial Traveller series focuses on four types of services utilised by millennial travellers: travel agents, airlines, tour operators and hostels. Visit www.wysetc.org/research to download our full range of reports or contact research@wysetc.org for more information.